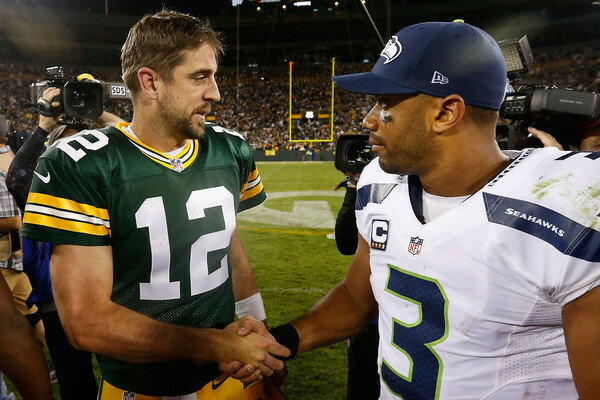 ~GREEN BAY, Wis. — Given time in the fourth quarter, Green Bay Packers quarterback Aaron Rodgers found the weakness in the Seattle Seahawks’ defense. Middle of the field. No Kam Chancellor at safety. Short passes turned into big gains. 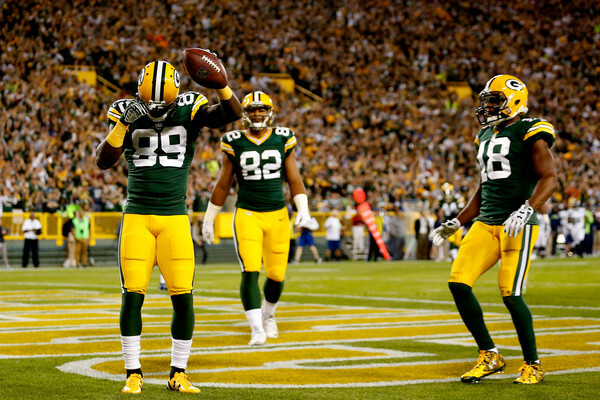 No second half collapse against Seattle on Sunday night at Lambeau Field. The home crowd made a big difference, as it did in Seattle each time there. The Packers now essentially own a three-game lead over Seattle in the NFC standings with the 2-game lead plus head-to-head win as tiebreaker (potential). Doesn’t look like another NFC title game of Packers at Seattle this season. If they meet, it will be at Lambeau, most likely. Arizona at a steamrolling 3-0 looks like the biggest threat in the NFC this year for the Packers. Also, watch out for the Grape Apes to the West. Rodgers and the defense came up big in the fourth quarter of a 27-17 win in a bruising, physical rematch of last season’s NFC title game. The crowd erupted at the end, releasing nine months’ worth of frustration. The Packers blew a 16-0 lead against the Seahawks in the NFC title game in January. They held on after giving up 13-3 lead at halftime on Sunday. The Seahawks, who fell to the New England Patriots in the Super Bowl last year, dropped to 0-2 for the first time since 2011. “But you have to move forward and realize there’s a lot of season left,” said quarterback Russell Wilson, who threw an interception in the fourth quarter. Rodgers stayed characteristically calm under pressure. He was a master at moving around to buy time. He took advantage of Seattle penalties with long throws for big gains. And in the fourth quarter, with the Packers down 17-16, he orchestrated a 10-play, 80-yard scoring drive, capped by a 5-yard scoring pass to Richard Rodgers. A 2-point conversion pass, also to Richard Rodgers, made it 24-17 with 9:28 left. Working without a huddle, Rodgers set up the score with short passes to Randall Cobb for gains of 18 and 19 yards, respectively. Ty Montgomery turned another short pass into a 17-yard gain. Rodgers and the coaching staff looked at film of Seattle’s defense before the drive and found a hole. “In the middle of their defense is where you can find some soft spots, that’s kind of what we targeted there,” the quarterback said. On Seattle’s next drive, Jayrone Elliott made a lunging, one-handed interception of a short pass from Wilson with 6:50 left, one of the rare mistakes in the second half for Seattle’s dual-threat quarterback. The Packers (2-0) cashed in with one of Mason Crosby’s four field goals on the night for a 10-point lead with 2 minutes remaining. “I’ve got a bum finger, so I had to catch it with one hand,” Elliott said. The defense held on when it mattered in the fourth quarter after giving up chunks of yardage earlier in the second half to dual-threat quarterback Wilson. The Seahawks’ last two series ended in turnovers. Besides Elliott’s pick, Micah Hyde recovered a fumble by Fred Jackson with 22 seconds left. 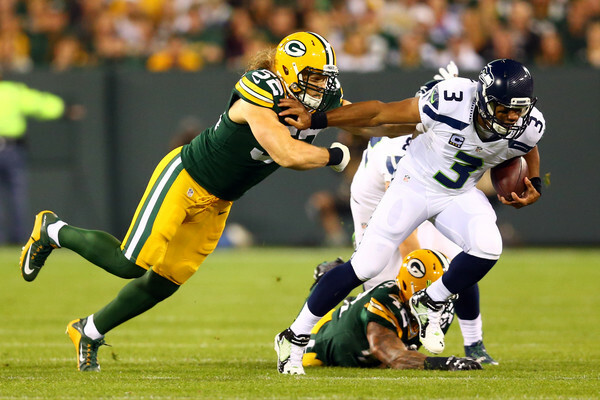 Wilson was 19 of 30 for 206 yards, while running for 78 yards on 10 carries. But he lamented the disappointing fourth quarter. Rodgers seized his opportunity. He finished 25 of 33 for 249 yards and connected with favorite target James Jones for a 29-yard touchdown pass on the game’s opening series. But the offense got bogged down or had to settle for field goals until the fourth quarter. Rodgers was clutch against a defense missing Chancellor, who is holding out for a new contract. Apparently, God let Wilson down this game. 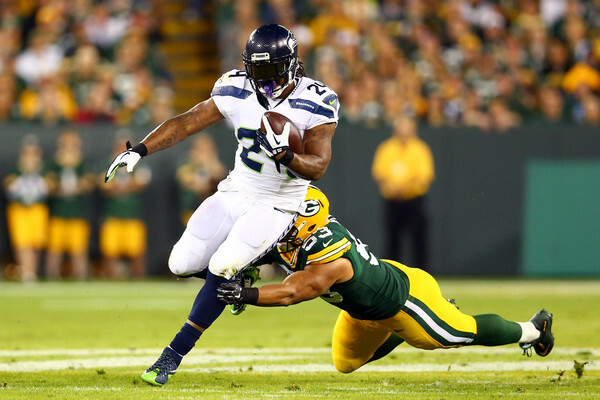 The Packers held Seahawks running back Marshawn Lynch to 41 yards on 15 carries. Green Bay running back Eddie Lacy left the game in the first quarter with a right ankle injury. Backup James Starks kept Packers running game going with 95 yards on 20 carries. With four field goals and an extra point, Crosby set the franchise record with 1,057 career points. CHICAGO — Aaron Rodgers saw James Jones go up for a one-handed touchdown catch and experienced a few flashbacks. Like they had stepped back in time. Rodgers threw for three touchdowns, two to Jones, and the Green Bay Packers beat Chicago 31-23 to spoil John Fox’s debut as Bears coach Sunday afternoon. The Packers got all they could handle from the rebuilding Bears but took control down the stretch to beat them for the 10th time in 11 games, including the postseason. Rodgers improved to 13-3 lifetime against Chicago. The 2014 MVP completed 18 of 23 passes for 189 yards. Jones, who spent seven seasons in Green Bay before signing with Oakland last year, caught four passes for 51 yards. That included a one-handed grab on a 13-yard score late in the first quarter that left Rodgers flashing back to 2012, when Jones led the league with 14 TD catches. He added a 1-yarder in the third — a good start after being released by the Raiders in the spring and by the New York Giants on the final roster cut. With Jordy Nelson (knee) out for the season, the Packers were quick to bring back Jones. Randall Cobb, hampered late in the preseason by a sprained right shoulder, had 38 yards receiving. He caught a 5-yard touchdown that made it 24-16 early in the fourth quarter, and Clay Matthews sealed the win by intercepting Jay Cutler at the Green Bay 20 and returning it 48 yards. Eddie Lacy ran for 85 yards and a late touchdown. Julius Peppers chipped in with 1 1/2 sacks for the four-time defending NFC North champions. The Bears, essentially starting over under Fox and new general manager Ryan Pace after a five-win season, kept this one close though Cutler had a rough afternoon. He was 18 of 36 for 225 yards, with that late interception by Matthews. He also threw a 24-yard touchdown to Martellus Bennett with 34 seconds left, but Green Bay recovered the onside kick. Matt Forte ran for 141 yards — 105 in the first half — and a touchdown. Alshon Jeffery caught five passes for 78 yards after missing the preseason because of a left calf injury. Robbie Gould kicked three field goals to give him 246 to surpass Kevin Butler as Chicago’s all-time leader. Green Bay, which outscored the Bears 93-31 over two games last season and beat them at Soldier Field for their 700th win, trailed 13-10 at the half. Rodgers finished a third-quarter drive with a 1-yard slant to Jones and Gould answered with a 44-yard field goal, cutting it to 17-16. Rodgers made it 24-16 early in the fourth when he hit Cobb with a 5-yard pass, capping a 16-play drive. But the Bears stalled at the 2 after Cutler’s 50-yard pass to Marquess Wilson. Cutler overthrew Eddie Royal in the end zone on fourth down after Chicago opted not to try a field goal. The Bears started two-time Pro Bowl RG Kyle Long at right tackle — a move that many saw coming after Jordan Mills got released a week earlier. Vladimir Ducasse started at right guard. … This was Forte’s fourth game with at least 141 yards and his highest output since he ran for 145 against Tampa Bay on Oct. 23, 2011. … Packers LB Sam Barrington sat out the second half because of an ankle injury. The injury is season-ending. The Packers are already thin at ILB as Ted Thompson has ignored the glaring hole in the middle, thinking Clay Matthews can solve all the woes there. He ignored the hole at safety from 2011-2013 too, before landing Haha Clinton-Dix in the 2014 draft. Many Packer fans wanted an ILB taken in round one this draft, with none being taken before the Packers pick at #30, Thompson had his pick of the litter. Instead, he elected to wait til mid rounds and pluck Jake Ryan out of Michigan.